Do you remember that very creepy, very good TV show a couple of seasons back starring Matt Dillon? The author of the novel that was based on also wrote this set of novellas. 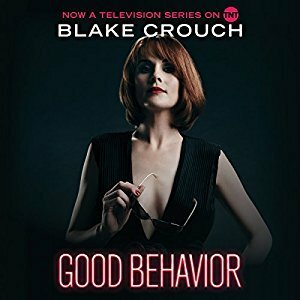 Evidently there is a TV show based on this character, too, and if it's even half as good as Wayward Pines I'll have to give it a try. If I weren't a fan of the author, I probably wouldn't have picked up this book. The character is not the kind that generally draws me in since she's a drug addict and a thief. I felt it was worth the risk, though, and I'm glad I took the chance. I love when an author is just so good that you can trust them to write a compelling story even if the premise doesn't draw you in. So, what is this book about? In the first novella, Letty is a meth addict and a thief who overhears a man hiring a contract killer to murder his wife. She can't go to the cops because she was in the middle of a crime when she hears this transaction. Instead she heads out to intervene and things go sideways. The second and third novellas have a similar feel. The poor girl can't catch a break. I would love to see the show and see what they did to transition the character and story from print to TV, especially after listening to the author's notes, talking about the process. I hope he writes more stories about Letty, too, but I get the feeling that his focus is on the screen version now and not the original. Five stars but with a content warning - there is some raunchy language and the situations are not kid-friendly.